I have a grandson with autism. He simply cannot sit still and focus. On the recommendation of an OT, I made him a weighted vest. Within several minutes of putting it on him, his mom related to me that he was more calm than he had been in a long time. He really responded positively to this simple vest, made by a loving Oma. Our family has a long history of sensitivity to petroleum products so I refuse to use poly pellets in my products. 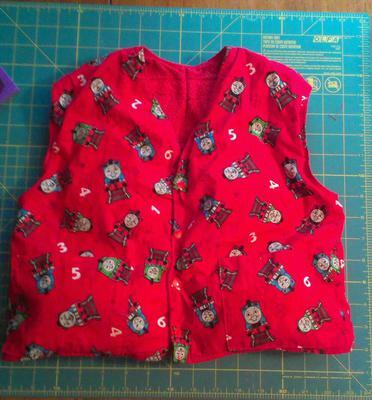 I made his vest with several small pockets inside the lining, each closing with Aplix (hook and loop tape made for use with diapers and other frequently messed-with items of children's clothing). Inside the pockets I placed little fabric bags containing rice and sewn shut. They are all double or triple stitched. 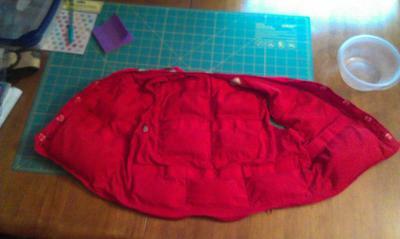 The vest was left open at the bottom when I sewed the lining to the outside. I then applied a zipper to the bottom opening in the back where he would really have to struggle to get to it. This makes the pockets accessible to Mom when it needs to be washed since rice obviously cannot go in the washer and dryer. Since he weighs just over 30 pounds, I added rice packets to make the total weight of the vest around 3 pounds, give or take. I also put snaps (applied with a snap press I bought for making diapers and diaper covers) on the front so he can't just yank it off and on any old time. This fills two purposes....first, he loves snaps and will play with them for a long, long time. He doesn't necessarily want to open and close them, but he rather enjoys the shininess of them and the feel under his fingers. 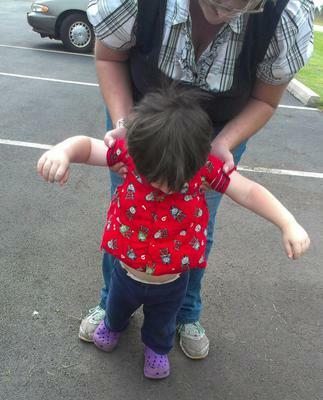 Also, it helps keep the vest on and the weight mostly evenly distributed. My daughter in law is now asking for a lap pad after just one day with the vest. She's a convert already. T has been quite a busy little man and she's experienced quite a change in him after putting the vest on for a trial period. I should probably buy stock in a rice company since she's bragging the vest up already and I get the feeling I'll be making more of them. Enclosed find a few simple pictures of the vest, inside and outside as well as on my grandson. Excuse the photo quality. He's not overly fond of cameras.